Nicholas Winton who saved hundreds of children from the Holocaust and didn’t tell anyone about it for over 50 years died Wednesday, July 1 in Maidenhead, England at the age of 106. With all the chaos and hatred that permeates today’s news, it is sometimes easy to forget that there are real humanitarians in this world who have accomplished extraordinary things. Nicholas Winton was one of those truly good people who remind us that good deeds can come out of bad events. How Nicholas Winton rescued 669 children from Nazi occupied Czechoslovakia on the eve of World War II is an amazing story told on the BBC 27 years ago and in America in 2014 on 60 Minutes. Here is a portrait of humanity at its best with 60 Minutes telling Winton’s story. This entry was posted in Commentary, History, Obituary, Television, World News and tagged World War II, YouTube on July 2, 2015 by Bert. Jean Beliveau, who won 10 Stanley Cup championships playing for the Montreal Canadiens from 1951-1971 died Tuesday, December 2, 2014 in Longueuil, Quebec at the age of 83. Beliveau was among the smoothest and fastest skaters I have ever seen. His hockey skills were extraordinary in every way. He dominated the game like only a handful of players have ever done. He had a wrist shot that was keenly accurate and was among the best play-makers to ever lace up a pair of skates in the NHL. Beliveau amassed 507 goals and 712 assists in 1125 games. In 162 career playoff games he tallied 176 points. A two-time Hart Trophy (league MVP) winner, he was the captain of the Montreal Canadiens for the final ten seasons of his career. Besides his greatness as a player, what people will remember about Jean Beliveau was that he was a modest gentleman, both on and off the ice. 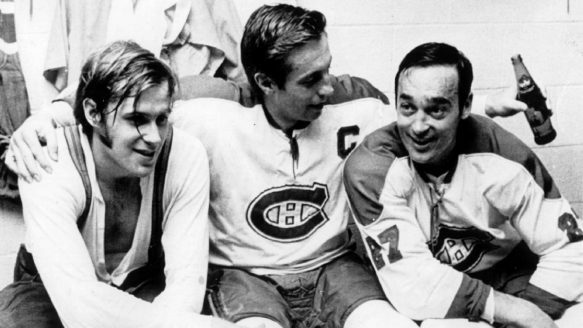 Teammates, opposing players, coaches and fans respected and admired Jean Beliveau. He carried himself with class, the way few athletes do nowadays. This entry was posted in Commentary, Obituary, Photography and tagged Hockey, Montreal Canadiens on December 3, 2014 by B.P.. When certain celebrities pass away it hits me hard. Sid Caesar was always one of my favorite comedians. His death at the age of 91 in Beverly Hills, CA on February 12, 2014, closes the book on the big TV comedy stars during the golden age of prime time television of the 1950’s. Lucille Ball, Jack Benny, Milton Berle, Red Skelton, Ed Wynn, Jackie Gleason, Ernie Kovacs, Phil Silvers – they’re all gone now. Sid Caesar’s meteoric rise at breakneck speed from 1950-1954 on Your Show of Shows and from 1955-1957 on Caesar’s Hour was offset by a steep fall into depression with drug and alcohol problems, which took him many years to recover from. To modern audiences Caesar may be best known for his movie appearances in Grease (1978) as Coach Calhoun and It’s A Mad, Mad Mad, Mad World (1963) as one of the treasure pursuers. But I would say for most people under the age of 40, the name Sid Caesar will draw a blank stare when mentioned. That is a shame. Here is a sketch that pre-dates the current health food craze by sixty years. What Sid Caesar accomplished besides entertaining millions with his hilarious sketches that the common man could relate to, was to bring together a staff of talent that influences modern comedy to this day. The writing and performing staff included Mel Brooks, Woody Allen, Neil Simon, Lucille Kallen, Imogene Coca, Carl Reiner, Howard Morris, Danny Simon, Mel Tolkin and Larry Gelbart. It is no exaggeration to say the annals of comedy would not have been the same without Sid Caesar. This entry was posted in Comedy, Movies, Obituary, Television and tagged Entertainment, Mel Brooks, Sid Caesar, YouTube on February 13, 2014 by B.P..
Jerry Coleman died at Scripps Hospital in San Diego, CA January 5, 2014 of complications from head injuries he suffered in a fall last month. In his major league baseball career he hit only 16 home runs and batted just .263, but the slick fielding Jerry Coleman was a beloved baseball legend by fans on both coasts. Coleman played his entire career for the New York Yankees from 1949 -1957. He appeared in six World Series, was the MVP of the 1950 World Series and appeared in one All Star game. This entry was posted in Baseball, Obituary, Television and tagged 1940s, Jerry Coleman, New York Yankees, News - Press Photo, Phil Rizzuto, Radio, San Diego Padres, St. Louis Browns on January 5, 2014 by Max. On Sunday, August 4, 2013 Art Donovan, one of the greatest tackles to ever play in the NFL died at the age of 89 of a respiratory ailment at Stella Maris Hospice in Timonium, MD. The New York Times obituary summarizes Donovan’s interesting life appropriately. I’ll just say that professional athletes like Donovan are a rare breed today; talented, honest, humble and funny. I remember the many classic Miller Lite beer commercials that Art Donovan appeared in. Unfortunately none are currently available for viewing. This video clip below from 1988 is a classic. Art Donovan is promoting the paperback release of his autobiography “Fatso” on Late Night with David Letterman. Letterman brings up the fact that when Donovan was on the show previously promoting the hardcover release of the book, Donovan admitted he had not read it. This entry was posted in Obituary, Television and tagged Entertainment, New York Times on August 6, 2013 by Max.